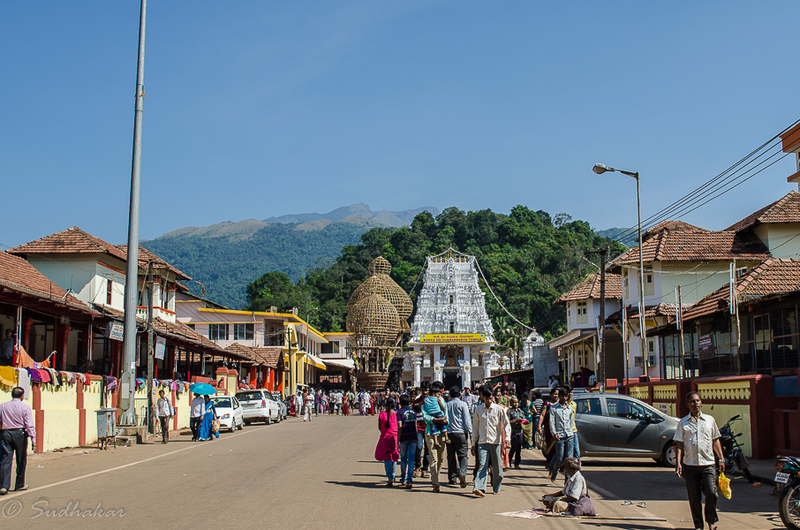 Kukke Subramanya temple is situated in a small town called Subramanya which is around 100 kms from Mangalore. As per legend serpent king Vasuki,known to be great devotee of Lord Shiva, was performing tapas for years in the Biladwara Caves of Kukke Subrahmanya to escape from the attack of Garuda. Heeding to Lord Shiva's request, Lord Shanmuga gave darshan to Vasuki and blessed him that he would stay with him in this place forever and thus protect him. Here Lord Shanmuga or Subrahmanya is worshipped as a snake. Though the temple structures may look new, the history behind the temple is said to be more than 4000 years old. As per edicts and Grantham this temple was known as Kukke Pattana. 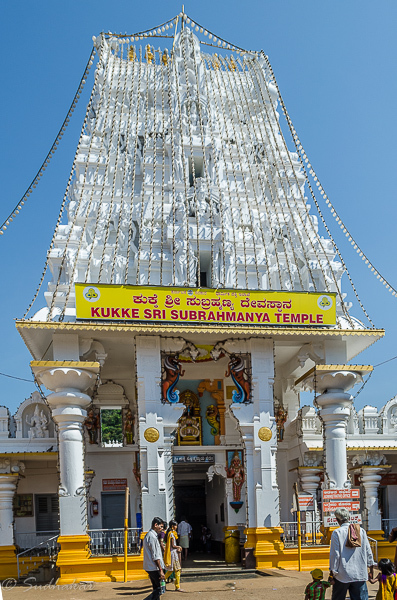 Sri Adi Shankaracharya visited Subramanya and referred this place in his Subrahmanya Bhujangam . Kukke Subrahmanya is said to be one among the seven holy places created by Parashurama is famous for “Naga aradhane” (worshipping of snakes). Residing with Vasuki, Lord Subrahmanya as the presiding deity showers his divine grace on devotees. The devotees believe that the holy bath in the Kumaradhara Thirtha and Madesnana eradicate dreaded skin diseases. Lord Subrahmanya here is known as “Annadana Subbappa” , meaning the one who feeds people at all times. Thousands of devotees receive Annadana here everyday.Devotees from all over India come here to perform sevas like “Sarpasamskara”, "Naga Prathiste”, “Ashlesha Bali” for removing sarpa dosham (curse of snakes), the symptoms they beleive are infertility, skin disease, blindness etc. The temple itself in not very huge and architecture wise not very significant. There is a Garuda pillar covered in silver,between the main sannidhi and the prahram entrance. Devotees circumambulate this pillar. It is believed that this pillar was erected there to shield devotees from the poisonous flames from the breath of Vasuki, who resides inside. 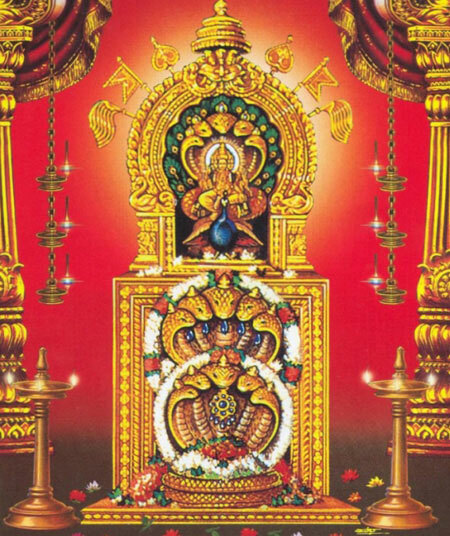 Beyond the pillar is the the sannidhi of Sri Subrahmanya. You can see the idol of Sri Subrahmanya and the deity of Vasuki on the upper platform and below that the deity of Shesha. Some useful cautionary tips Male devotees should not enter the temple wearing shirt, banians as in Kerala temples. Faiths & Beleifs People suffering from Sarpadosha (cursed by Snakes- according to beliefs someone in this birth or in any of his previous births, either intentionally or unintentionally harmed a snake and therby getting the wrath of the snakes) undertake the special sevas here. Soil taken from anthill is the main Prasada here. Festivals Nagapanchami, Skandha sashti, Champa Shashti Rathothsava,Ratha Sapthami Utsava,Maha Sivarathiri are some of the important festivals other than the daily rituals and pooja. How to Reach The nearest airport is the Mangalore International Airport, which is about 115 kilometres from here. You can reach Subramanya by a car or a cab. The nearest railway station is Subrahmanya Road railway station on which is 12 kilometres from here. There is a daily passenger train services from Mangalore, Bangalore. The route from Sakaleshpura to the Kukke Subramanya Road station runs through dense green forest and is very scenic. Where to Stay There are lodges belonging to the temple where you can find accomodation with basic amenities. There are also a few modest hotels here in Subramanya. Where to eat? The temple provides for all devotees hot food three times a day which is very tasty and hygienic too. There are a few eateries which are average only.